I find it odd that no major filmmakers are tacking the Syrian refugee crisis. Estimated 5 million people fled the war torn country since 2012 and the number easily doubles when you add up internally displaced refugees. I find it doubly odd that it is Aki Kaurismaki, the Finnish master of deadpan comedy taking on the topical subject. First it was his French language film Le Havre, which dealt with immigration. With The Other Side of Hope, Kaurismaki lends a hand, with his light touch, on Aleppo, without sacrificing the seriousness of the situation. Surprisingly, the result is an affecting, optimistic look at human kindness and decency. It also turns out to be one of his finest films. There are two strands of narrative at the start of the film. One about a Syrian refugee and the other, an aging, troubled traveling salesman figuring out his life. Somewhere their paths cross. Khaled (Sherwan Haji) is first seen emerging from the mountain of coal in a cargo ship docked at a Helsinki harbor. As he seeks an asylum as a Syrian refugee from Aleppo at a police station, the unsympathetic police puts him in a waiting facility to be processed. There he meets an Iraqi refugee who's been in Finland for a while and seems to know the way around. Khaled is desperately looking for his sister who was separated on their way out of Syria. He likes Finland and wants to get a job and settle down. But first, he needs to not get deported. His Iraqi friend gives him some pointers, "Don't look so glum. Be cheerful. They deport sad looking ones." 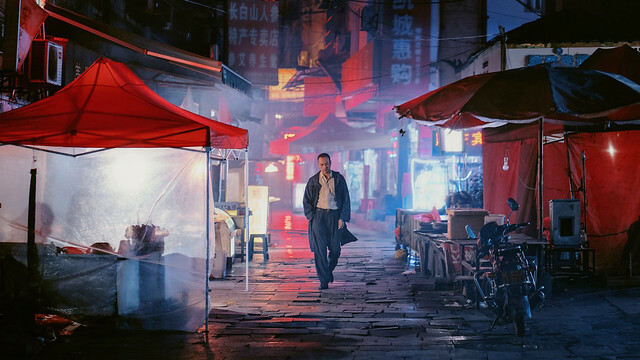 Wikstrom (Sakari Kuosmanen), a middle-aged traveling man's shirt salesman, walks out on his wife, and embarks on a restaurant business with the money he won at a gambling table. It's a little dumpy restaurant/bar called Golden Pint. The owner seems very eager to get out the dodge, and leaves three disgruntled employees behind- a doorman, a waitress and a cook for Wikstrom to deal with. In the mean time, Khaled flees from the refugee facility after judge deems that his situation is not dire enough and decides to deport him back to Aleppo. Khaled gets into a fistfight with Wikstrom at a parking lot where he was sleeping. And Wikstrom decides to hire him for his restaurant. 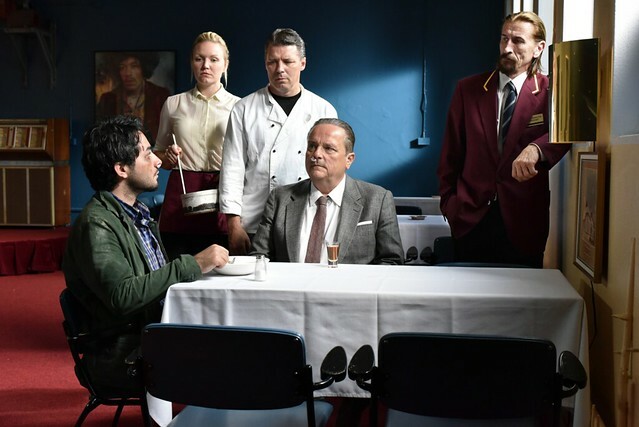 There are many Kaurismaki comedic moments and sight gags throughout the film. His brand of minimalist comedy is truly unique.His cultural references are all mixed up and wrong- Kati Outinen, one of Kaurismaki's regular, plays Wikstrom's client who says "I'm going to Mexico and dance Hula Hula." and Golden Pint crudely changes to Sushi restaurants to attract more customers, serving a spoonful of wasabi on each sushi. When they run out of fish, they use salted herring. It is priceless to see the defeat on the crew's faces as the customers leave in droves. Khaled is pursued by Finnish nazis with nationalist slogans on their jacket. Kaurismaki encapsulates them in one utterance near the end of the film, showing that nazis, in any country, are ignorant assholes and absolutely need to be eradicated. Extremely silly and endlessly charming, The Other Side of Hope reminds us that the complicated world we are living in doesn't need to be complicated. Through the Kaurismakian glass, the world is filled with decent people and it remains a hopeful place as long as people help each other out. The Other Side of Hope plays as part of NYFF 2017 at Film Society of Lincoln Center on 10/5 and 10/10. Please visit FSLC website for tickets and more information.